In an effort to create a new narrative for aboriginal peoples, the University of Saskatchewan has complied more than 25,000 digital artifacts for indigenous research. This portal originating in 2011, showcases a turtle housing research topics such as Indigenous law, spiritual knowledge, economic development and education (plus more). Once your selection is made, the portal provides articles, book reviews, e-books and additional digital artifacts on the selected topic. 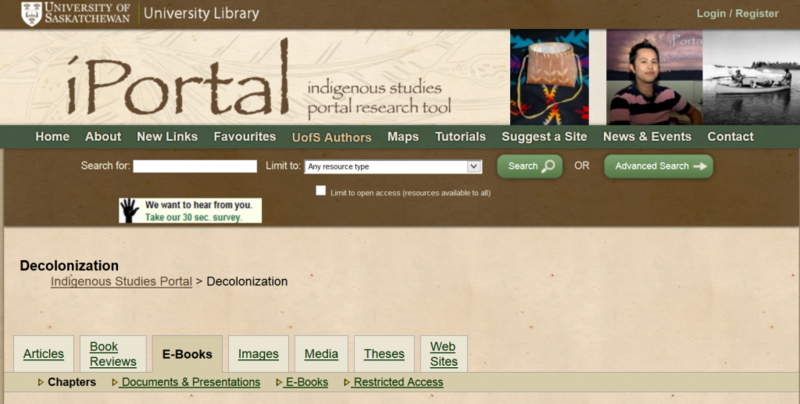 The portal also allows for collaboration, as community members are able to suggest digital resources for publication. In addition, the Maps section is helpful for visualizing locations of First Nations groups within specific provinces. This would be a great resource for school-aged children to add context to Aboriginal curriculum. This is a must-use website for Aboriginal research.